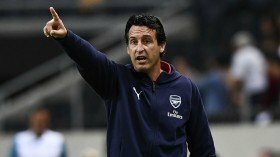 Arsenal manager Unai Emery has confirmed that the club are restricted to loan deals this month despite the requirement to strengthen the squad further. The Gunners have been hampered by season-ending injuries to Danny Welbeck and Rob Holding this term and this has recently linked them with probable options to reinforce the squad. However, speaking in a news conference, Emery has confirmed that permanent deals appear unlikely for the month and the club will have to pursue loan moves for players with the obligation to buy. "We cannot sign (players) permanently. We can only loan players. Only loan players. I can say to you that the club is working, the club is telling me the different situations in each moment," he said via The Mirror. Arsenal have been linked with Barcelona's Denis Suarez and Dalian Yifang's Yannick Ferreira Carrasco this month but so far, they have yet to make progress regarding temporary deals for either player.